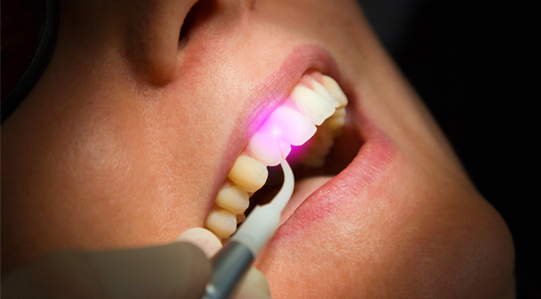 Laser dentistry is one of the most innovative dental care options. By using extremely focused light beams, our consultants will remove or alter tissue in small parts. Having its various advantages, the laser can be used in different dental procedures, including the most common ones which are gum tightening, teeth whitening, and treatment of pericoronitis. As the treatment is a minimally invasive dental care option, it will reduce the overall tooth loss and less damage to gums which shortens the healing time. Since the laser will sterilize the gums, there will be fewer chances of infections. It is a minimally invasive option for someone who has to go through gum surgery, cavity treatment, or other oral issues. It is an ideal kind of dental treatment for children, pregnant women and people who get really nervous about dental treatments. Laser dentistry can be used for number of treatments which includes: Sulcular Debridement (Gum Curettage), Laser-Assisted New Attachment Procedure (Gum Tightening), Reduction of Bacteria Level, Laser Wound Healing /Biosimulation, Laser Root Planning, Aid in the Diagnosis of Caries, Hard Tissue Applications, Root Canal treatment, Teeth whitening. We only use world class soft tissue lasers for various dental treatments. The process will be painless, comfortable and causes minimal swelling after the treatment. At Identity+, we provide cost-effective dental treatments without compromising the quality of the entire procedure. We guarantee the best dental solutions using only quality dental products during the process.